Puncture Proof Tyres from Mobility Pitstop. 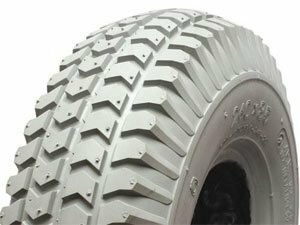 These tyres are completely solid, and therefore cannot be punctured or burst. 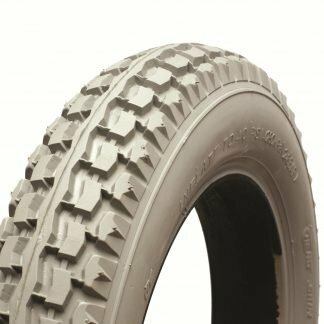 Mobility Pitstop now offer solid puncture proof tyres which are manufactured using improved polyurethane processes which are much lighter and provide a much softer ride than traditional rubber based infill processes. In fact the ride quality is virtually identical to a pneumatic tyre. Puncture proof tyres have long tyre wear, and excellent ride quality. The inner tube is replaced with a rubber compound, and you no longer need to constantly check tyre pressures on your scooter. Optimum tyre wear is guaranteed. It is usually possible for a mobility scooter or powered wheelchair to convert from using its existing pneumatic tyres to puncture proof ones. By converting, you may save money and hassle by not having to buy replacement tyres and inner tubes quite so often, although the initial outlay may be more. Scooters and powered wheelchairs are far more likely to get punctures and damaged tyres than a car or other road vehicle. A puncture can leave you unable to get in and out of your vehicle, or get home. The tyres are far more likely to get damaged because of the surfaces they cover, such as pavement edges, and the sides of roads where debris collect. The alternative to puncture proof tyres is to try using sealant, but this is very fiddly and can cause other problems with the tyres. By fitting tubeless tyres, or puncture proof tyres, you are far less likely to get a puncture in the first place, and even if you do pick up a nail, you can usually get home. Mobility Pitstop can supply you with infilled puncture proof tyres on a next day delivery service for applications which have split rims. These are easy to fit yourself. We can also provide an infill process service onto existing single piece rims using our excellent and trusted suppliers. Please contact us on freephone 08082 819 522 for further details.